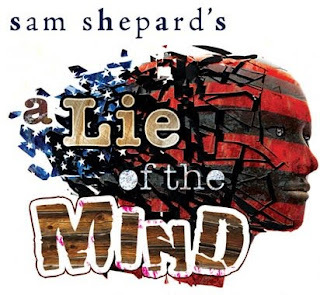 My friend Jon used descriptions like ‘poetic’ and ‘a world with it’s own set of rules’ as we left the latest staging of Sam Shepard’s A Lie of the Mind…and I couldn’t agree with him more. Directed by Ethan Hawke (yes THAT Ethan Hawke! ), this nearly three hour two-act is taught and tight, see-sawing two families and their shared dilemma, caused by the one brother who…well, I won’t give it away. Wild action occurs in this hyper real Sam Shepard world my friend Jon alluded to, where the west was never truly won and people skitter round their damaged pasts. With an exquisite set by designer Derek McLane (really one of the most imaginative I have seen in a while) and backed by the haunting music of Shelby and Letham Gaines (playing ‘electrified’ brooms and such), Hawk brings all the odd elements of wood together to build a really great “Lie,” where in actuality I feel this play is not one of S.S.’s best. The big cast is spot on though, with special mention to Keith Carradine, Maggie Siff, a kinetic Frank Whaley and can-she-be-any-better, Laurie Metcalf!